The incident set off a worldwide fervor for UFOs. The problem with the story of the Roswell crash is that the publicized information we’ve all been given is conflicting, to say the least. I’ve gathered the main details, so we can look them over. 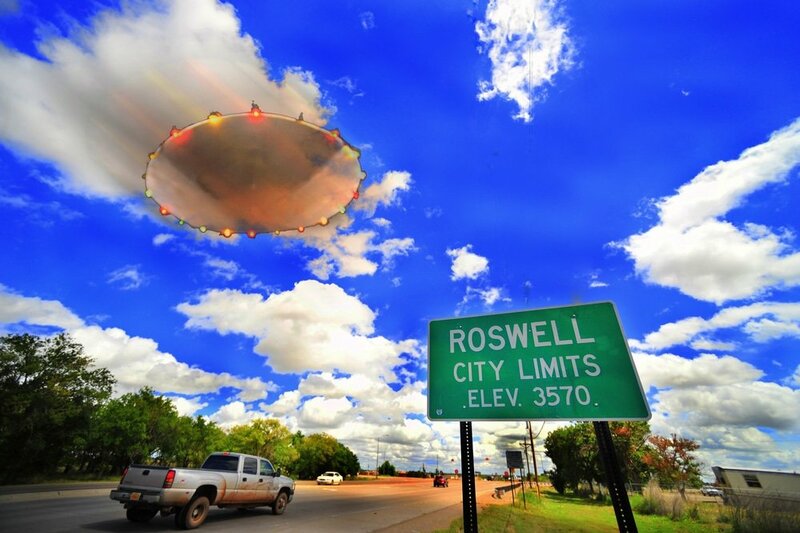 On Tuesday, July 7th, 1947 as Dan Wilmot, Roswell resident, and business owner, sat with his wife on their front porch he spotted something in the sky shaped like a saucer. It sped toward them then suddenly disappeared from sight. He reported it to the Roswell Daily Record the next morning. Sheriff Wilcox contacted Colonel “Butch” Blanchard at the Roswell Army Airfield, who reported the incident to his superior, General Roger W. Ramey. Then Blanchard sent Intelligence Officer, Major Jesse Marcel, to investigate the crash site and collect any debris left from the incident. Years later, in 1978, UFO researcher Stanton Friedman interviewed Marcell, who basically told him he didn’t believe the materials he found came from a weather balloon or for that matter from anything on earth. After that, Public Information Officer, Lt. Walter Haut, wrote a press release that in essence said they believed they had found a “flying saucer”. And, on July 8th, the Roswell Daily Record’s front-page headline was “RAAF Captures Flying Saucer on Ranch in Roswell Region”. Then another press release was issued with the correction that it turned out it was just a weather balloon that had crashed. On July 9th, the Roswell Daily Record ran a story with the headline, “Army Debunks Roswell Flying Disc as World Simmers with Excitement”. Years later, Lt. Walter Haut stated the weather balloon photo was staged and the materials shown in it weren’t from the crash site. And, in 1994, the government acknowledged a cover-up but said it had nothing to do with extraterrestrials, instead the weather balloon was part of the 1947 top secret Mogul project, which used microphones and balloons to detect sound waves from bomb tests at long distances. And, as if this news wasn’t mysterious enough, it was also discovered that all Roswell Air Force Base records from, from January to October of 1947 were destroyed. In 1947, Roswell radio news announcer, Frank Joyce, interviewed the rancher who discovered the crash site, Mac Brazel. He told Joyce he saw alien bodies at the crash site. However, the FCC and a US senator called the radio station and asked them not to air the story. Other witnesses also described the alleged extraterrestrials’ bodies as short, with large heads, large eyes, and a hole in place of a human type nose. In 2008, a flight engineer, who had been stationed in a debris receiving hangar at the Roswell Army Airfield back in 1947, came forward and stated that it was a spaceship that crashed. Also, there was a rumor that an alleged “memory metal” that was thin, smooth, weightless, and couldn’t be cut, scratched, or burned, though it could be temporarily manipulated was found amongst the crash debris. So that’s the basic information. The incident set off a worldwide fervor for UFOs. But 72 years later we’re no closer to discovering the truth of what happened July 7th, 1947. The Roswell crash remains a mystery. I think the only one of my characters who gets to go to Roswell, is in Steamrolled. But the hubs and I are planning a road trip there in the RV if not this summer, then the next. What about you? Believe? Don’t believe? Been there? Tell me about it! P.S. I have (to me) a funny story about my research of Roswell for Steamrolled.